When I was young, it was easy to remember all the people I prayed for: me. It's not that way any more. As I've grown to know and love more people, one of the great challenges and benefits is that it affects my prayer life. The list gets longer. The time with God gets longer. In all honesty, right now I'm at the place where I can't remember all of the requests for the friends, family, and missionaries I know and love. So I've had to start using a list. Again. And lately my list has been growing. It takes more time. And that's a good thing. I'm spending more time with God. I'm focusing on the needs of others. I'm praying for God's Kingdom on earth. Sometimes it sounds like, “Lord, will you give an answer to this person?” or, “Move in power in this person's life.” But to God, I believe it sounds like His heart repeated back to Him in the needs and lives of His people, appointed by Him and in relationship with others. Lord, may my list of thanksgiving and requests grow until prayer and passion for Your Kingdom consume my life. How about you? 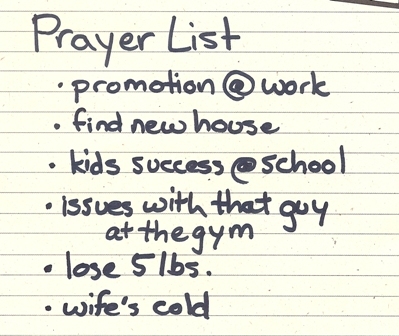 Has your prayer list been growing? Do you have a list? If not, I recommend you check out the [7:14] Prayer Movement app. It's not perfect but it works for me.